The dustcover on my copy of Epictetus: Discourses Books 3-4, Fragments, The Encheiridion is falling apart. It's a compact book, but thick since it's printed in both original Greek and the English translation. The cover is worn because I read it at least weekly, if not daily. Epictetus comes with me on trips. His words served me well in New York during Hurricane Sandy and over the holidays visiting family. A practicing Stoic doesn't need this particular printing of Epictetus' works, but every Stoic should be immersed in Epictetus' words. The Loeb Classical Library edition comes in two volumes. The second is the long title I mentioned at the start. The first is Epictetus: Discourses Books 1-2. Both volumes are printed with the Greek text facing an English translation. This is part of the reason I purchased the Loeb set. I have minor experience with ancient Greek and I find it can be helpful to look at the actual word used by the author from time to time. Trust me, if you ever see the word love used in an English translation of a Greek sentence, you have no idea what the writer actually meant. The other reason I have the Loeb edition has to do with my religious past. I used to have a bible with me everywhere I went. I'd missed having a source text to review. Now these books are on my nightstand. They have heft. They feel and smell like a book should. It feels good to have a tangible reminder of my philosophy close at hand. 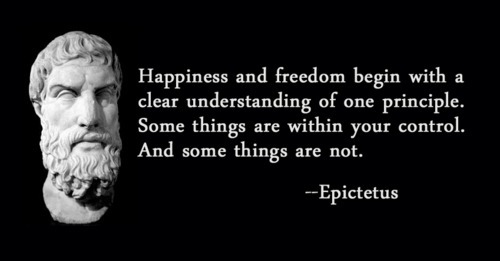 Epictetus' works are the only lengthy thoughts of a stoic teacher that we have access to. For all the helpful guidance that can be found in Seneca and Marcus Aurelius' writings, they were not teachers, but practitioners. They are our peers. Epictetus was a teacher, devoted wholly to the teaching of Stoic principles. He didn't write the Discourses, etc... himself. An industrious student named Arrian wrote down his lessons and left us with a detailed, if haphazardly arranged outline of Epictetus' teaching sessions. I am so glad that he was a good note taker. If you were inclined to only purchase one of the two volumes, it's the second that is most necessary. No Stoic should be without the Encheiridion (the Handbook). The Handbook consists of 52, often short, chapters of condensed Stoic thought. It was meant to guide new Stoics. It is invaluable. The Handbook's opening sentence is arguably the most famous Stoic quote, "Some things are under our control, while others are not under our control." From there he lays out the Stoic life. The Discourses themselves are lengthier discussions of the same thoughts found in the Handbook. They are worth wrestling with. Get yourself a copy of Epictetus' works. The Loeb edition will last you a lifetime but there are also free versions online (some with less than perfect translations). In any case, one of our ancient teachers is still able to instruct us. That's a gift that should not be passed up. Posted in Books and tagged with reviews. March 19, 2013 by Matt Van Natta.